Tonight on FOX Masterchef returns with an all-new Wednesday, September 7, 2016, episode and we have your Masterchef recap below! 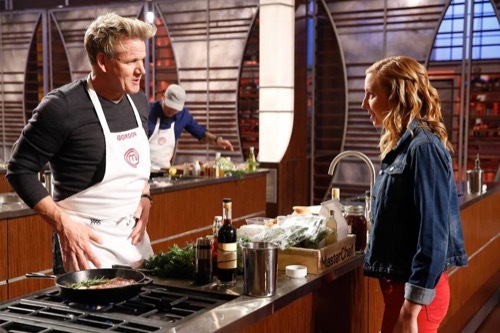 On tonight’s double-episode of Masterchef called, “Family Drama – Critics Choice,” the final five contestants are introduced to special culinary guest judge Richard Blais – chef, restaurateur and cookbook author – who reveals the seventh Mystery Box challenge. Did you watch last week’s episode where Katie was sent home and the Top 5 moved forward? If you want to get catch up before tonight’s episode we have a full and detailed Masterchef recap of last week, right here for you! Don’t forget to join us for our Masterchef recap tonight from 8PM – 10PM to find out which contestants have what it takes to make it to the Finale. While you wait for the recap, make sure to check out all our Masterchef recaps, news, spoilers & more! The five remaining contestants were introduced to special culinary guest judge Richard Blais on tonight’s two-hour episode of “MasterChef”. Richard Blais was apparently world renowned because he wasn’t just a chef. He was also a restaurateur as well as a celebrated cookbook author however in tonight’s kitchen he was the man that revealed the latest Mystery Box Challenge. Although before he was able to do so, the judges had just more surprise up their sleeve it seems. So the judges decided to reveal that before the Mystery Box Challenge because they said it would actually help explain a few things. And so the judges’ surprise was a visit from loved one. The Top Five have been away from home for weeks now so a visit a with the family was something they all needed even if they didn’t know it. However, while seeing their many family members tonight did a lot to individually cheer them up, the Mystery Box Challenge as it turns out, was made a lot more difficult what with their loved ones giving an opinion. The contestants’ families were asked to provide one ingredient that they knew the contestants could cook well with. And so it was their families that had chosen the key ingredients in their Mystery Box Challenge. The Mystery Box Challenge tonight required that the chefs cook a MasterChef Worthy Meal with just the one ingredient and a staple pantry box provided to them by the judges. So that meant they couldn’t just go into the regular pantry and grab hold of everything they wanted, but instead had to make do merely with what they hand. Though, given their limited resources, many had simply tried elevate their everyday dishes back home and unfortunately that didn’t always work out. Which was the case with a stern face David. David had tried to make an elevated Cherry Tart because his young daughter had picked cherries for him and he really wanted to impress her. But the tart had been too plain. It had looked like something he could have made during week one and not necessarily at this point in the competition. So sadly David’s didn’t get called for judging and naturally he wore a sour face as his arch nemesis Shaun had been called up instead. And so David had taken losing out to Shaun this time extremely personal seeing as his daughter had been there to see it. Yet, Shaun and the others had been called up because they had truly shown some impressive skills tonight with their limited options. Shaun for instance, had cooked his egg yolk ravioli that was a hit with tonight’s guest judge while Tannoria had impressed the judges with her play on peaches and Dan had delighted them with his blackberry and peppermint pastry. So it’s not like they didn’t put their back into it and admittedly it wasn’t a surprise that Shaun managed to win that Mystery Box Challenge with something as complicated egg yolk ravioli though his advantages for winning that particular challenge were unique. Shaun apparently had a late in the game advantage. So he just thought that he was free from elimination when the judges told the contestants to pick out only twenty ingredients from the pantry. But low and behold his other advantage kicked in after the other four had done what they had been asked to. So Shaun’s second advantage it seems was to choose who would cook with someone else’s basket and so Shaun purposely went out of his way to make things difficult. He gave Brandi David’s basket because he knew she was unfamiliar with such high-end products and he gave David Dan’s basket because he knew how vexed David would be with what Dan picked. Dan had unfortunately picked packaged trout as his sole protein and the rest of his ingredients had been all over the place. So in actuality Dan’s basket had been a hot mess and that had set David off. Davis had been ticked from the second he lost the Mystery Box Challenge to Shaun so the basket merely made him loose the rest of his cool. However, the basket thing had nearly been the end of David because David had gotten so fed up with what he had that he left the kitchen in a temper tantrum. And Chef Ramsay had to go running after him just to convince him to stay. So Ramsay was able to talk David into coming back into the kitchen however their conversation as well as David’s tantrum had made him lose precious time. Yet, while the judges didn’t like seeing David’s nasty temper making a sudden if not brief reappearance, they at least wanted to give him a chance and had tasted his dish. David had made Smoked Trout Endive Cups with Kohlrabi Greens and Rice and the dish had promise even if it didn’t really live up to it. The dish was slightly all over the place and admittedly that was more Dan’s fault than David’s. Only David didn’t help himself out with that temper of his. And therefore David knew he was going to be in the bottom two if the others hadn’t made terrible dishes. Though he hadn’t expected that both Tanorria and Brandi would excel the way they did with the dishes they made for the judges or that he would be facing off mostly against Dan. Dan’s admittance into the Top Five wasn’t really taken seriously and that had mostly been Dan’s fault. Dan was still the frat guy that he joked around too much yet the dish he had made for tonight’s elimination challenge had gone just one joke too far when some of the judges questioned if he was copying another contestant. Dan had gotten Tannoria’s basket earlier and weirdly he went on to basically steal her recipe for the Deconstructed Jambalaya that he claimed would look different though it didn’t and had surprisingly hadn’t been executed half as well. So Dan’s dish had been overall disappointment. However, his failure had been up against David’s and that meant either of them could go home. And yet the judges ended up sending Dan home despite everything that David did. So at the end of the first half, the Top Five became the Top Four when they had to say goodbye to their favorite Frat Boy Dan. But tonight’s second half had probably one of the toughest challenges that the Top Four had ever faced in this competition if not their cooking careers. Tonight the Top Four had another Team Challenge and the challenge itself was scary as all what. The Red and Blue Teams were apparently going to be cooking for some of the toughest critics in the world and these critics were so scary that the judges even admitted to being a little terrified them. So the teams that cooked tonight had to be on point and that was why when Brandi was given the choice to pick who was on her team – she chose to go with Shaun over everyone else. Brandi it seems had full knowledge of the risks she was taking in this challenge and so she chose to go with Shaun over David’s because she knew she couldn’t afford to have David lose his temper on her during such a challenge. Yet, Brandi also stated that cooking with Shaun was also going to be a challenge all on its own. Brandi said that if her team lost then she was going to have to cook against her former teammate and in this case that meant she was going to have cook against someone like Shaun. Who was basically the gold standard this season and would be tough competition for anyone in the eventual Pressure Test. Brandi though chose to take that risk because of the David factor. So Brandi and Shaun who were on the Blue Team had come up with a method on how to make their team work. They had later seen the box that they were going to be working with and they had both fallen in love with all of the colors. Speciously as there was a lot of bright purple and green cabbage as well as purple asparagus on top of it. And so Brandi and Shaun to play on those colors. They ended up picking the brightest side vegetables and then picked the protein to accompany it. However, the Red Team had been a little more traditional. David and Tanoria had chosen first their protein and then everything else. Though like expected, David’s temper did show itself in the end. David and Tanorria had chosen to cook Duck and the judges had thought that their dish would be the highlight of the team challenge yet some of their duck pieces were coming out raw and unfortunately that made David lose his temper. So David had nearly thrown in the towel when he thought that they wouldn’t be able to put their dishes out in time and it had honestly taken everything out of Tanorria to talk David down rather than just punching him. Yet, David and Tanorria were able to get their Duck Breast with Ras El Hanout, Brussel Sprouts Slaw, and Polenta Cake out in time. So it had been pure luck that Tanorria had been able to talk him down in time because they would have lost the competition if David had been allowed to wallow, but the Blue Team hadn’t done so bad themselves. The Blue Team had cooked Halzenut Crusted Halibut with Meyer Lemon Beurre Blanc and Asparagus Salad. And their dish had both colorful and fancy. So when the critics began their work, it could have gone either way. Some loved the pops of color on the Blue Team’s dish and some hated it though some people loved the Red Team’s dish and some people hated that so no one team knew how well they fared. But the judges took a look at the critiques and judged who was the winner based on the favorability they saw. And so tonight’s Team Challenge winners was the Blue Team. Shaun and Brandi had won over the critics with their colorful halibut and that meant they didn’t have to cook against each other in tonight’s Pressure Test. Tonight’s pressure test however was an uncomfortable one. Both Tanorria and David had gotten the feedback from the Team Challenge and the biggest marker against them had been the cook on the duck. So Tanorria blamed David for that and David blamed himself for that. Though regardless of what they both felt about the situation, David didn’t just walk away this time and give up. Instead he chose to stay on and tried to complete the pressure test in spite of his own securities getting in the way. And tonight’s pressure test was replication. Both Tanorria and David had to replicate all three pork dishes that the judges chose. Out of their own handbook no less. So the former Red Team had to cook up a pork tenderloin dish, a pork belly, and a pork chop dish. Yet, right out of the gate Tannoria had made a mistake. Tannoria had left her pork tenderloin to the last second and that ultimately resulted in her pork tenderloin being a little bit raw in the center. Otherwise though most of Tanorria’s dishes had all of the required ingredients on them even if her pork was never quite perfect while her opponent continuously lacked a few things on his plate. So that made the judges choose who came the closest in their replicated dishes. However, that person ended being David so it was David that got to be the third chef in next week’s finale. And sadly Tanorria was eliminated on tonight’s double episode.